You must bring the sword to the govenor. But where to find it? It’s probably in the chest upstairs. Walk over there and try to use the chest. It’s locked. Back downstairs you can talk to the blacksmith all you want, he’s not going to wake up. Leave the room by using the front door. On the streets walk left and see a HORN hanging on the wall. Pick it up and take it inside again. Use the horn with the blacksmith and he’ll wake up… not!. At least he dropped the KEY. Pick it up and go upstairs to the chest again. Use the key with the chest and it opens. You take the SWORD out. Go downstairs again and leave the house. You’ve stolen a ship but did a lousy job. This one is not pirate worthy and has to be taken back… if it will float. Pick up the BAG OF SEEDS for the parrot and find NAILS and a HAMMER underneath. See the water at the back of the ship splashing up? Below it is a hole. Use the room on the ship to see what you can repair it with and all you can find is a BROKEN ROW. Use the row on the hole in the back and that should at least bring you to Port Royal. Once there, you must find a ship fast enough to catch up with the Black Pearl. You don’t want to marry Commodore Norrington. So you jump from the cliff and are saved by Jack. The servants find you and want to arrest Jack, even if he saved your life. But Jack won’t be caught that easilly. He jumps into the water and swims off. You must find a place to hide. Walk into the blacksmith. Ask Will if there’s a back door and he’ll point it to you. But he won’t let you through. So your start a fight. Don’t worry, nothing serious, just words. It doesn’t matter what you say, it’ll stop eventually. To get past Will, you take your pistol. But he won’t be scared that easilly. Then the servants walk in and you are arrested. In jail you have to find a way to get out. You only have your bag of seeds left. But that should do the trick. Use the seeds on the rat in the cell with the skeleton. That way the RAT walks towards the seeds and you can pick her up. Use the rat to fetch one BONE from the skeleton. Now the rat can eat all it wants. Use the bone on the dog. But you won’t get that far. A familiar sound of cannons from the Black Pearl chase the dog away, including the key. They’re here to get the last golden coin. But you’ve hidden it somewhere… somewhere…. where’s that coin? Use the bed to search it and find your BRA. Look at the bra to detect that there are NEEDLES in it. But no coin. On the left panel of the screen in the left upper part of your room is your vest. Use the vest to search it and find your jewels chest. Look at it and find it locked. Use a needle on the chest to open it and inside is a KEY. Use the small key on the chest in the lower right corner of the room to get the coin. 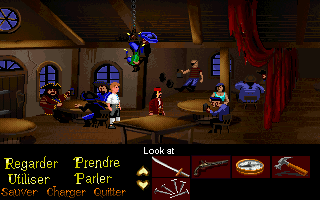 As soon as you take the coin, the pirates enter the room and will take you to the Black Pearl. Talk to the captain and tell him you came to negotiate to end the hostilities. He won’t cooperate. Use the coin on the sea behind you to threaten the captain. Since he’s very interested in the coin, he’ll cooperate this time. You’ve heard about the capture of Elizabeth. You must go and help her. Take the BUCKET behind you and leave the room. Walk towards the left and use the door to enter Jail. Talk to Jack Sparrow to tell him Elizabeth has been kidnapped. Jack knows the Black Pearl sails to the isle of Muerte. Ask Jack to come along if you can free him. He agrees and now we only have to get him out of jail. Leave the building on the right and walk back towards the harbour. Use the bucket on the water to get a BUCKET WITH WATER. Enter the blacksmith and use the bucket with water on the METAL BAR over the fireplace. This way it’s not too hot. Leave the blacksmith again and go to the left and enter Jail again. Use the metal bar on the jail door and free Jack. Use the cupboard in the corner to get all your stuff back. Then leave jail and walk to the right towards the Interceptor. Use the ship to enter and now you have to get rid of the crew. Throw the bone into the water so Gilette is distracted. Hit him so get goes overboard and you can use the Interceptor to sail to the Black Pearl. You want the coin back to blackmail the captain Barbossa again. But how to get it? Use an old trick on the chest again. Take the needles and pick the lock of the chest. Once it’s open you see only food. Take the BANANA out. Why do ghosts need food? Use the ladder to go to the upper deck. Walk across the deck to the other side and use the door to get into the hut of captain Barbossa. He’ll explain to you why he needs the coin and why you’re still alive. Disgusted you leave the hut but change your mind outside. Go back into the hut and give the banana to the monkey. It’s a nice animal and you can pick the MONKEY up. Leave the hut again and walk to the center of the deck where you can see the sea. Use the monkey on the sea to drop it there and captain Barbossa will come running for him. Now that the captain is out of his hut, you can enter it again and take the COIN from the wall. As soon as you try to leave the hut the captain returns, including that monkey, who steals the coin from you. And since you won’t be quiet, you’ll be put far away for now. Inside town, walk to The Merlu on the corner and talk to him. He’ll tell you about his lost sword. Walk across the street and talk to the female pirate. Ask if she has seen Gibbs. She’ll only tell you in return for something. Walk across the street again and enter the tavern on the right, halfway down the street. Inside, walk all the way to the right and talk to the barman. Ask him for a bottle of rhum and he wants to see some coins for that. You have no money, you get no rhum. Ask him about the sword of The Merlu and he’ll tell you he left it in the bar yesterday. You tell him you’ll return the SWORD and you get it from him. Before returning the sword you want to make a little money out of it. Give the sword to Will and ask him to break the sword. When that’s done, leave the tavern and walk back to the corner and give the broken sword back to The Merlu. At first he’ll refuse it, saying it’s not his, but when convinced, he’ll accept. Tell him you know a way to repair it, at a nice fee of course. He’ll pay the COINS. Return to the tavern and walk to the right again. Give the coins to the barman and you’ll get your BOTTLE of rhum. Leave the taverns and across the street give the bottle to the female pirate. She’ll tell you Gibbs is in the tavern so you can go back to the tavern again. Enter the tavern again, walk all the way to the right and talk to Gibbs. He’ll assemble a crew for you and you can set sail. After a while you’re at Captain Barbossa’s place. You want to rescue Elizabeth but Jack won’t let you pass. Use the bucket on Jack to cover his head and go up the stairs. The ghost crew is trying to transform but have little luck. Talk to Barbossa (at least pretend) and tell him you’re the Aztec God. Tell them that they haven’t finished the sequence yet and where they can do that. They run off and Elizabeth can run to you. Go back down the stairs again and use the row boat. Leave Jack where he is. Once at the ship you can sail away. On your journey, the Black Pearl will come and try to attack. To defend yourself you need to man the cannons and load them. But there are no cannonballs. We have to make them ourselves then…. Use the door on the north to enter Elizabeths hut again. Look around for stuff you can use to make cannonballs. Use the desk to find a GOBLET. Use the closet and take a SHOVEL out. Next to the stairs is a chest in which you find an old POT. Leave the room on the left and behind the mast are stairs to below decks. Use these to get to the bunks. At the far left is a chest. When you open it you find an old SAW. In the bed with the blue sheets is a FILE. Take it. Use the ladder to the right of this bed. Downstairs is Fester. Talk to him and ask him for cannonballs. Not in here, only powder. Take the GUNPOWDER from the barrel next to Fester. In the lower right corner is another chest. Open this one and find a pair of ROWS. Walk back to the ladder and climb it. In front of you, on the other side of the room are stairs leading down. Go there. Talk to the strong man, Meathook, and ask for cannonballs. Not in here either. On the left of the room is a cupboard. Use it to take a POT out. Underneat the cupboard are some things. Use these as well to discover a STAFF. Time to make a recipe. First we need to heat up the stove. Use the rows and the staff on the fire. But it’s still not hot enough. Use the saw on the shovel to cut the STICK off. Put the stick in the oven as well. Now it’s hot enough. Use the goblet, the shovel and the pot on the pot in the middle. Do the same with the pot, the saw and the file. That’s enough to make three CANNONBALLS. Not great but at least it’s something. Use the ladder to go one deck up and use the next one to go to the upper dec. Give the cannonballs to Anamaria. Prepare for battle. The ship didn’t hold and you are picked up by the ship of Barbossa. After a discussion with Barbossa, you sacrifice yourself to free the rest. When he asks who you are tell him you’re Bootstrap Bill’s son. Your death will keep the ghosts cursed forever. When Barbossa asks what you want tell him you want him to free Elizabeth and the rest of the crew. After a few days Barbossa keeps his word and frees Elizabeth and Jack…. on a deserted island. Looking at the jungle there’s only one way to get the route to the rhum. Use the compass on the jungle and you’re at the crates in no-time. The chests are locked however. But they are old and not very strong. Use your sword to open the crates and take the RHUM out. Walk to the south to return to the beach. Give the rhum to Elizabeth. The next morning the jungle is on fire. Elizabeth took the rhum to set fire to the trees to attract other people and the get rescued. Not long thereafer you’re picked up by the govenor. Elizabeth tells her father about Will and that he’s on the Black Pearl. The govenor doesn’t want to rescue him. Only if she marries Commodore Norrington. Tell them that you can’t believe they’ll let the pirates go. Tell him then that it’s the last pirate threat in the caribbean and that it would be a good credit for him. They’ll agree and you must cooperate in finding the island. They won’t cooperate so you have to rescue the crew yourself. But then you first have to get out of this room. Use the hay. There’s a ROPE in it. Then use the fruit to take a BANANA from it. Use the pot in the center with the skull on it to take some GREASE. Use the window behind the pot to escape but it make a bit of noise. So they will notice when you’re going. Use the grease on the window to lubricate and then use the rope to get out… Hmm. Not. The rope isn’t long enough. Use the bra on the rope and then use that on the window to get to the Black Pearl. In Barbossa’s place, climb the stairs to disturb the execution of Will. Tell him you’re there to warn him. The Intrepide is waiting outside to catch Barbossa and his crew. So he must kill all the soldiers also if he kills Will. When Barbossa asks for your motives tell him you have a good soul. Or is it the Black Pearl you’re after? You let the ghost crew take care of the men on the Intrepide. Since they are ghosts, they can’t be killed. Now that you’re on the Black Pearl you must see to free the crew. On the right is a monkey garding the door. Look at the door to learn that the crew is indeed behind it. Using the door is useless, it’s locked. Use the stairs to go below decks and find another guard there. Talk to the skeleton and ask if he guards the key. He does. Ask if he want’s to give it and he doesn’t. So there must be a way to distract him and get the key. Use your jewel chest on the skeleton and eventually he’ll look the other way. Then use the skeleton to get the KEY from him. Use the ladder to go up again and use the key on the door. This is what the monkey will prevent. Give the banana to the monkey and he’ll take a hike. Use the key on the door again to free the crew. Tell them to free Will and they won’t. They’ll stay on the Black Pearl. You’re on your own…. again. At Barbossa’s place climb the stairs. On your way you hear a shot. Once you’re upstairs, you see that Jack shot his only bullet at Barbossa. But since he was still a ghost, the bullet missed…. or? Will was just in time to put the last coin in the chest and drip some of his blood with it. Barbossa turns into a mortal again. A dead mortal, shot by the only bullet Jack had. On the Intrepide the ghost pirates turn into mortals as well and are arrested. Will and Elizabeth return to the Intrepide, Jack goes to the Black Pearl. But that sailed off with the crew. So they all return to the Intrepide where the Commodore awaits. Tell him you don’t want to marry him and he’ll understand. Because of the discussion, Jack sees a chance to flee again and joins the crew on the Black Pearl. The Commodore wishes you good luck with your blacksmith….. or is it pirate?